No matter where you are, no matter who you are, you most probably have heard about Windows. This is the most popular operating system around the globe, sold to billions of individuals, small companies, corporations, you name it… Its developer – Microsoft Corporation is one of the most powerful technology companies of our time. They are really huge – this enterprise is valued at nearly 430 billion US dollars. Can you believe that this thing was started in a garage…? Microsoft, also known as ‘Microcomputer Software‘, was founded in 1975 by two young entrepreneurs – the 19 years old William Henry Gates III (Bill Gates) and 22 years old Paul Allen from Albuquerque (New Mexico). They have been friends since they were children, and they both have been very interested in technology since a very young age. They were obsessed by the belief that personal computers would become integrand of people’s lives. So, this was how their first company, Traf-O-Data, was founded in 1972. It offered a device that tracked automobile traffic. One day, in January 1975, a high-tech magazine devoted its cover to an article, which featured information for the first personal computer Altair 8800, developed by Micro Instrumentation and Telemetry Systems. Allen spotted an opportunity in this, he thought they could create an interpreter(a simple programming language) for this computer or just BASIC ( Beginner’s All-purpose Symbolic Instruction Code). That would be a software, in which the computer could be used. Then Bill gates called Micro Instrumentation and Telemetry Systems (MITS) and told them they already had a working interpreter for their device and arranged a demonstration. But this was actually a lie, they hadn’t made anything they just had a plan in their heads how to make it. So, when MITS requested a meeting in order to see the interpreter, the young entrepreneurs had a few days to create it from zero. There also was another little problem, they didn’t even have a computer Altair 8800 to use it for the development of the interpreter. So, Allen created a simulator and Gates wrote the software using it. When they went to show it to MITS, everything worked perfectly. The young entrepreneurs got a contract, their application would be marketed as Altair BASIC. A few months later, on 4th of April 1975, they founded Micro-soft (this was the first name of the company, ‘micro’ deriving from ‘microprocessor’ and ‘soft’ from ‘software’). In 1977 Microsoft launched its second product, Microsoft FORTRAN, another programming language, and soon brought out versions of the BASIC language for microprocessors 8080 and 8086. In this year the first employer of the company was hired. One year later (1978), they launched their third product – COBOL-80 – a computer language that would later become so popular, that in 1997, 80% of all business application would be written in – COBOL. In 1979 Microsoft changed the location of its headquarters and from Albuquerque (New Mexico) moved to Bellevue, Washington, where it settled until 1986 from where moved to Redmond. In 1980 Gates asked his former roommate in college – Steve Ballmer to become a vice president of the sales department. During the same year, IBM approached Microsoft and offered them to write the operating system for their new IBM PCs, which were designated to be marketed globally during the following year. Gates, Allen and Ballmer knew that this is a huge opportunity for them. At that time IBM was a leader in this industry and Microsoft was a little dwarf striving for survival. They needed this deal at any price, but there was a little obstacle in their path… They did not have time to create a new operating system and meet the required deadlines. So, they lied that they had exactly the solution that IBM needed and would give it to them if Microsoft kept the license for the operating system… IBM agreed! This was the most important decision for the young company. Having the legal rights, they could sell their operating system to anyone and at the same time, IBM could use it too! Now the young guys had only to cope with their little problem – the absence of operating system… Actually, the first operating system of Microsoft was a new version of Unix called Xenix, but IBM wanted their operating system to be based on another OS called CP/M. They knew, that a guy, working in a small company, had developed what they needed. This man was named Tim Patterson. He had created a simple disc operating system for personal purposes called Q-DOS. One day, he was sitting on his chair, when a man appeared in front of him (Paul Alan) and offered the amount of $50 000 for this software. Patterson was really shocked. One crazy man wanted to give him a decent amount of money for a software he had developed for just several weeks. He accepted… This is how Microsoft acquired all rights for the Q-DOS, which was later renamed to MS-DOS (Microsoft Disk Operating System). In February 1981 the first version of MS-DOS was run on an IBM and although it was full of errors, it was released for mass use in July. Multi plan – a spreadsheet program was released in 1982 and the following year Microsoft Word was created. Microsoft was one of the first companies in the sector that was dedicated to developing applications for Macintosh, a personal computer made by Apple Inc. Microsoft had great success to sell Macintosh software such as Word, Excel and other applications. In 1985 Microsoft launched Windows OS – an operating system that resembles extended MS-DOS and incorporated for the first time a graphic user interface. In 1986, Microsoft launched an initial public offering (IPO), selling to the public 3.095 million shares at the price of $21 each. When the trade session was opened, the first deal was made at a price above $25 and the session closed at $27.75 per share – 32% increase for just one day. 12 000 employees would later become millionaires, from their stocks in the company. In 1990 the consolidated Windows version 3.0 was released. It included many new features. The update had an improved management of applications, icons, and system stability. Microsoft had become the leader of software companies with annual sales of over one billion US dollars. When Microsoft was on the top, the company was accused of exercising monopolistic business practices. In 1990, the U.S. Federal Trade Commission investigated Microsoft, but was unable to pass sentence and closed the case. Microsoft and IBM ended a decade of collaboration in 1991. NT (New Technology) was created in 1993 and Windows NT operating system became a core focus to the business. It has quickly become the platform for advanced workstations, servers and software developers. In 1995 the company launched Windows 95, a multitasking environment with a simplified interface and other enhanced features. Only seven weeks after its release seven million copies were sold. 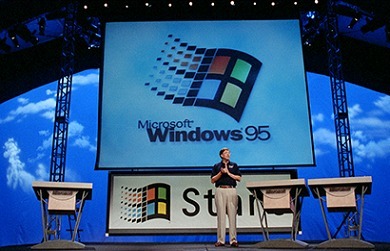 Microsoft released Windows 98 in June 1998. It was an operating system aimed at home users and the main novelty was the total integration of Internet browsing. It also has enabled DVDs and USB connection. The lawsuit against Microsoft for violating antitrust laws began in October 1998. In January 2000 Bill Gates, who was the chief executive (CEO) was replaced by Ballmer, a change that allowed Gates to focus on the development of new products and technologies. 2000 is the year when the company launched Windows Millennium Edition (Windows Me) again with new features focused on home users as the ability to manage digital photos and music, working with video and communicating with friends and relatives around the world. In the same year, Microsoft also wanted to launch Windows 2000 Professional, so as to replace Windows 95, 98 and NT. Microsoft released first Windows XP Tablet PC Edition in 2002. It was focused on digital entertainment, and finally, in 2005 the release of Windows XP 64-bit Edition became a fact. Even though the history of Microsoft may seem controversial and too good to be true, the company has managed to acquire new markets and businesses. It is one of the most known high tech companies of our century. On February 1st, 2008, Microsoft made an unsolicited bid to buy Yahoo for $ 44.6 million. The offer was later rejected. Microsoft is one of the most successful technology companies and undoubtedly it’s one to remember for a long time as it changed the way technology is used and accessed by the wider target audience and non-savvy users. To learn many more details about the creation and early development of two of the most significant tech companies – Apple and Microsoft, we strongly recommend watching the movie “Pirates of Silicon Valley“. This is a very interesting movie about the beginning of the business lives of Bill Gates, Steve Jobs and the other people around them, who helped with the creation of these very successful enterprises today.